The beginnings of an identifiable Christian art can be traced to the end of the second century and the beginning of the third century. Considering the Old Testament prohibitions against graven images, it is important to consider why Christian art developed in the first place. The use of images will be a continuing issue in the history of Christianity. The best explanation for the emergence of Christian art in the early church is due to the important role images played in Greco-Roman culture. As Christianity gained converts, these new Christians had been brought up on the value of images in their previous cultural experience and they wanted to continue this in their Christian experience. For example, there was a change in burial practices in the Roman world away from cremation to inhumation. Outside the city walls of Rome, adjacent to major roads, catacombs were dug into the ground to bury the dead. Families would have chambers or cubicula dug to bury their members. 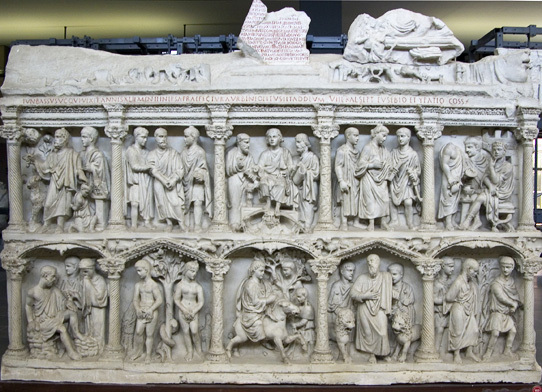 Wealthy Romans would also have sarcophagi or marble tombs carved for their burial. The Christian converts wanted the same things. Christian catacombs were dug frequently adjacent to non-Christian ones, and sarcophagi with Christian imagery were apparently popular with the richer Christians. A striking aspect of the Christian art of the third century is the absence of the imagery that will dominate later Christian art. We do not find in this early period images of the Nativity, Crucifixion, or Resurrection of Christ, for example. This absence of direct images of the life of Christ is best explained by the status of Christianity as a mystery religion. The story of the Crucifixion and Resurrection would be part of the secrets of the cult. While not directly representing these central Christian images, the theme of death and resurrection was represented through a series of images, many of which were derived from the Old Testament that echoed the themes. For example, the story of Jonah—being swallowed by a great fish and then after spending three days and three nights in the belly of the beast is vomited out on dry ground—was seen by early Christians as an anticipation or prefiguration of the story of Christ’s own death and resurrection. Images of Jonah, along with those of Daniel in the Lion’s Den, the Three Hebrews in the Firey Furnace, Moses Striking the Rock, among others, are widely popular in the Christian art of the third century, both in paintings and on sarcophagi. All of these can be seen to allegorically allude to the principal narratives of the life of Christ. The common subject of salvation echoes the major emphasis in the mystery religions on personal salvation. The appearance of these subjects frequently adjacent to each other in the catacombs and sarcophagi can be read as a visual litany: save me Lord as you have saved Jonah from the belly of the great fish, save me Lord as you have saved the Hebrews in the desert, save me Lord as you have saved Daniel in the Lion’s den, etc. 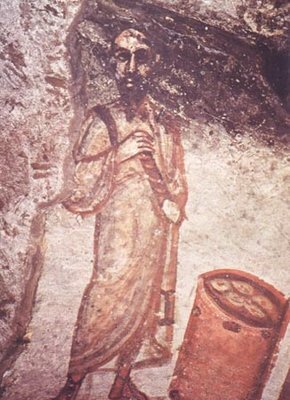 One can imagine that early Christians—who were rallying around the nascent religious authority of the Church against the regular threats of persecution by imperial authority—would find great meaning in the story of Moses of striking the rock to provide water for the Israelites fleeing the authority of the Pharaoh on their exodus to the Promised Land. One of the major differences between Christianity and the public cults was the central role faith plays in Christianity and the importance of orthodox beliefs. The history of the early Church is marked by the struggle to establish a canonical set of texts and the establishment of orthodox doctrine. Questions about the nature of the Trinity and Christ would continue to challenge religious authority. Within the civic cults there were no central texts and there were no orthodox doctrinal positions. The emphasis was on maintaining customary traditions. One accepted the existence of the gods, but there was no emphasis on belief in the gods. The Christian emphasis on orthodox doctrine has its closest parallels in the Greek and Roman world to the role of philosophy. Schools of philosophy centered around the teachings or doctrines of a particular teacher. The schools of philosophy proposed specific conceptions of reality. 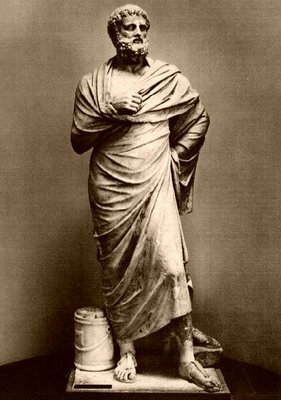 Ancient philosophy was influential in the formation of Christian theology. For example, the opening of the Gospel of John: “In the beginning was the word and the word was with God…,” is unmistakably based on the idea of the “logos” going back to the philosophy of Heraclitus (ca. 535 – 475 BCE). Christian apologists like Justin Martyr writing in the second century understood Christ as the Logos or the Word of God who served as an intermediary between God and the World. 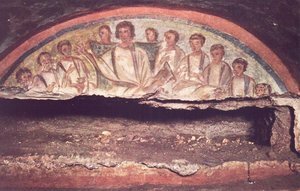 An early representation of Christ found in the Catacomb of Domitilla shows the figure of Christ flanked by a group of his disciples or students. Those experienced with later Christian imagery might mistake this for an image of the Last Supper, but instead this image does not tell any story. It conveys rather the idea that Christ is the true teacher. Christ draped in classical garb holds a scroll in his left hand while his right hand is outstretched in the so-called ad locutio gesture, or the gesture of the orator. The dress, scroll, and gesture all establish the authority of Christ, who is placed in the center of his disciples. Christ is thus treated like the philosopher surrounded by his students or disciples. Comparably, an early representation of the apostle Paul (left), identifiable with his characteristic pointed beard and high forehead, is based on the convention of the philosopher, as exemplified by a Roman copy of a late fourth century B.C.E. portrait of the fifth century B.C.E. playwright Sophocles (right). Cite this page as: Dr. Allen Farber, "Early Christian art," in Smarthistory, August 8, 2015, accessed April 21, 2019, https://smarthistory.org/early-christian-art/.